The recent unveiling of the Week 3 BES rankings depicted the Vikings (No. 11) falling just outside of the elite ten teams in the BES. The Vikings enter a pivotal Week 4 matchup that could propel them into the Top-10 and dramatically alter the face of the Top-5 with a win that will not come easy. This is a remarkably tough draw for the Vikings as they are up against a defense that is playing head and shoulders above its contemporaries. The Broncos’ boast a No. 1 BES Defense that has earned a score of 3.49. However, the Vikings feature an impressive defense of their own, ranking seventh in the BES with a 2.72. Those numbers imply which ever offense does a better job of controlling the clock and putting points on the board could emerge the victor. 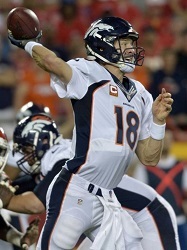 It’s no secret the Broncos have struggled offensively but quarterback Peyton Manning has shown resolve in the face of adversity, engineering game-winning drives in the previous two weeks. However, the Broncos have struggled to run the ball effectively whereas the Vikings’ ground attack has been a strength behind workhorse halfback Adrian Peterson. Peterson, after gaining just 31 yards on 10 carries in a season-opening loss to the 49ers, has rushed for 260 yards and two touchdowns, averaging 5.3 yards per carry. Second-year quarterback Teddy Bridgewater has been far less impressive with just 505 yards passing, two interceptions and one touchdown on the season. The prescription for the Vikings is a heavy dose of Peterson, forcing the Broncos to key on him which could provide Bridgewater some opportunities through the air. Nevertheless, if Manning catches fire early then the Broncos might build a lead that puts the Vikings chances of winning squarely on the shoulders of Bridgewater. 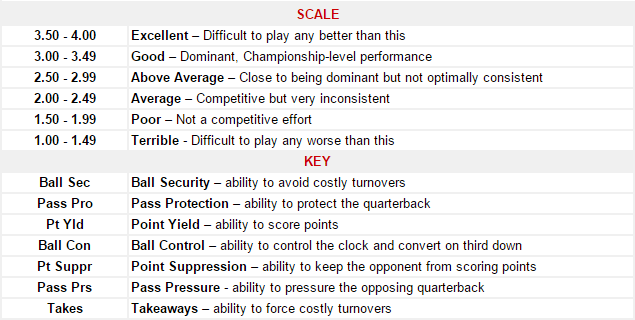 That would feed right into Denver’s defensive strengths – Pass Pressure (3.91) and Takeaways (4.00). This is a game with a lot at stake for the Vikings. A win could land them in the Top-10, topple the Broncos from No. 1 and, most importantly, help them keep pace with the Packers (3-0) in the NFC North.